Chris showed me a new fun trick to create some interesting playlists in iTunes. 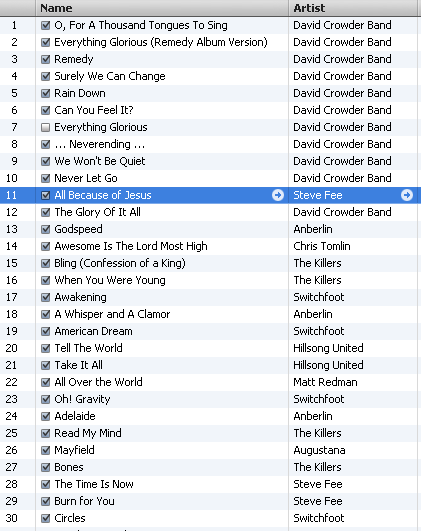 I’ve created for you my “Most Played Songs of 2007 That Were Added in 2007” from the computer at the church. It’s pretty interesting. There are more songs here that we don’t play than I expected. Typically songs that we’re going to play get beaten to death on my church computer. I can’t wait to compare to what got played most at home! I can’t believe I listened to The Killers so much here at the office 🙂 Hahaha. Anyone know how to do this with your iPod? That’d the most interesting and accurate indication of what I truly listen to!